Filing For Bankruptcy, Borders Hits Troubled Times Borders filed for Chapter 11 bankruptcy Wednesday with the announcement that the company will close 200 bookstores. Lynn Neary reports on the company's future. After weeks of speculation, Borders has made it official. The bookstore chain filed for Chapter 11 bankruptcy protection Wednesday in a federal courthouse in New York. Among its creditors are some of the most prominent names in the publishing industry: Random House, HarperCollins, Penguin and Simon & Schuster, to name just a few. And though the company got enough financing to see it through the reorganization process, its future remains unclear. Just a few hours after the news first broke, Dan Scholz was shopping at his local Borders in Washington, D.C. As he left the store, Scholz said he was upset to hear about the Borders bankruptcy, even though he often shops at one of the competitors that brought his superstore down. "You know I use Amazon a lot for book shopping," Scholz says. "But it's nice to have a place that you browse, actually look at books that you can touch, taste and smell." Matthew Katzenberger also shops for books online and said he wasn't surprised about Borders' predicament: "The thing is, I always sort of feel depressed when I go into a bookstore because I can't imagine how they keep going." 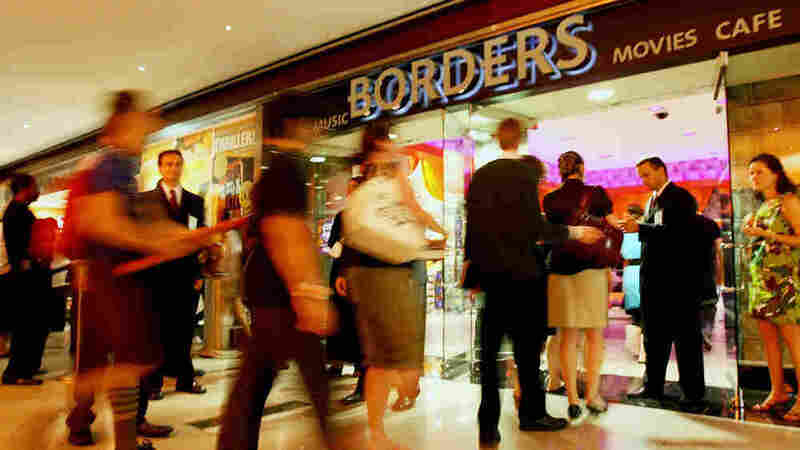 Some 200 Borders stores around country are scheduled to close. James McQuivey, an analyst with Forrester Research, says he's surprised the news wasn't even worse. "I really thought there was a strong possibility of liquidation here," he says. "That we'd pull a Circuit City, you might say, and suddenly announce that everything's on sale including the carpet." Borders In Bankruptcy. Is Your Bookstore Next? The company has received $550 million in restructuring finance from a group of investors led by GE Capital in an effort to stay afloat. Dan Raff, an associate professor or management and finance at the Wharton School of the University of Pennsylvania, says that GE Capital must have some faith that Borders can turn things around, given the hefty investment. "The investors in this reorganization have access to more information than people in the ordinary public and one has to imagine that they looked very hard at the question of what the near-term prospects were and whether they were going to get their money back," Raff argues. "The longer-term prospects for physical book retailing are quite obscure." The financing, says Raff, will give Borders some breathing room to consolidate and restructure, but the company still has to deal with challenges from digital books and online retailing. McQuivey says that closing 30 percent of its stores may not be enough to save Borders: "You go back 10 years and think of the companies that used to sell CDs and DVDs. It included Tower Records and Strawberries, and these companies are all gone. They're not just smaller. There's no reason to expect that the book business won't have a similar fate. And so it's really, really hard to see where any optimism is coming from unless you have a really dramatic shift in mind and I don't know what that shift might be." But Borders is expressing optimism, stating that with reorganization, it still has the potential to be a "vibrant national retailer of books — and other products."